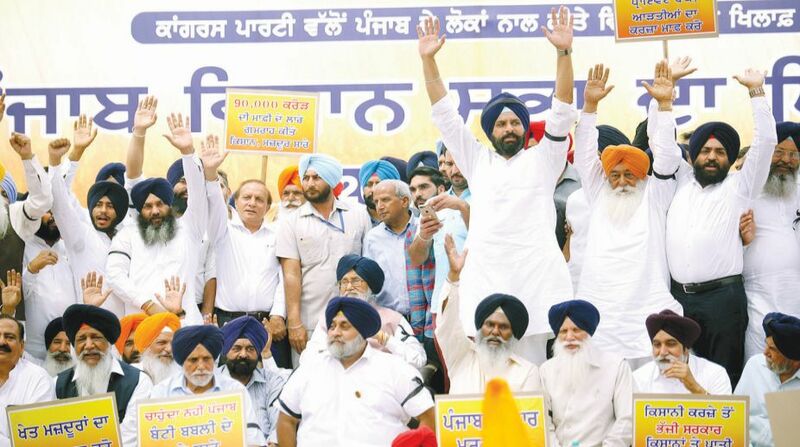 Shiromani Akali Dal (SAD) on Tuesday held a protest against the Congress government’s failure to implement the Rs 90,OOO Crore loan waiver promise. “We demand implementation of a complete Rs 90,000 crore loan waiver of all farmers including loans from nationalized and cooperative banks as well as private money lenders. This loan waiver scheme should also be extended to farm labourers and dalits. If this is not done in the next phase of our agitation we will gherao Congress ministers to force the government to honour its complete loan waiver promise,” SAD president, Sukhbir Singh Badal. He said the party would not allow the government to impose bills on agricultural tubewells. “We will fight this tooth and nail and not allow the government’s nefarious design to impose bills on the agriculture sector to succeed”, Badal added. Addressing the rally at Sector 25 ground , former chief minister (CM) Parkash Singh Badal said many governments have implemented loan waiver schemes. “The Congress government can also do it. We provided a relief of Rs 60,000 Crore to farmers by reimbursing the State utility for their tubewell bills”, he added. The former CM gave a clarion call to the farmers not to pay their debt. “Amarinder Singh has given you sworn affidavits stating he will give your debts. Now he must fulfill his promise”.